Explain what an experiment is and recognize examples of studies that are experiments and studies that are not experiments. Explain what internal validity is and why experiments are considered to be high in internal validity. Explain what external validity is and evaluate studies in terms of their external validity. Distinguish between the manipulation of the independent variable and control of extraneous variables and explain the importance of each. Recognize examples of confounding variables and explain how they affect the internal validity of a study. As we saw earlier in the book, an experiment is a type of study designed specifically to answer the question of whether there is a causal relationship between two variables. In other words, whether changes in an independent variable cause changes in a dependent variable. Experiments have two fundamental features. The first is that the researchers manipulate, or systematically vary, the level of the independent variable. The different levels of the independent variable are called conditions. For example, in Darley and Latané’s experiment, the independent variable was the number of witnesses that participants believed to be present. The researchers manipulated this independent variable by telling participants that there were either one, two, or five other students involved in the discussion, thereby creating three conditions. For a new researcher, it is easy to confuse these terms by believing there are three independent variables in this situation: one, two, or five students involved in the discussion, but there is actually only one independent variable (number of witnesses) with three different conditions (one, two or five students). The second fundamental feature of an experiment is that the researcher controls, or minimizes the variability in, variables other than the independent and dependent variable. These other variables are called extraneous variables. Darley and Latané tested all their participants in the same room, exposed them to the same emergency situation, and so on. They also randomly assigned their participants to conditions so that the three groups would be similar to each other to begin with. Notice that although the words manipulation and control have similar meanings in everyday language, researchers make a clear distinction between them. They manipulate the independent variable by systematically changing its levels and control other variables by holding them constant. When we read about psychology experiments with a critical view, one question to ask is “is this study valid?” However, that question is not as straightforward as it seems because in psychology, there are many different kinds of validities. Researchers have focused on four validities to help assess whether an experiment is sound (Judd & Kenny, 1981; Morling, 2014): internal validity, external validity, construct validity, and statistical validity. We will explore each validity in depth. Recall that two variables being statistically related does not necessarily mean that one causes the other. “Correlation does not imply causation.” For example, if it were the case that people who exercise regularly are happier than people who do not exercise regularly, this implication would not necessarily mean that exercising increases people’s happiness. It could mean instead that greater happiness causes people to exercise (the directionality problem) or that something like better physical health causes people to exercise and be happier (the third-variable problem). The purpose of an experiment, however, is to show that two variables are statistically related and to do so in a way that supports the conclusion that the independent variable caused any observed differences in the dependent variable. The logic is based on this assumption : If the researcher creates two or more highly similar conditions and then manipulates the independent variable to produce just one difference between them, then any later difference between the conditions must have been caused by the independent variable. For example, because the only difference between Darley and Latané’s conditions was the number of students that participants believed to be involved in the discussion, this difference in belief must have been responsible for differences in helping between the conditions. An empirical study is said to be high in internal validity if the way it was conducted supports the conclusion that the independent variable caused any observed differences in the dependent variable. Thus experiments are high in internal validity because the way they are conducted—with the manipulation of the independent variable and the control of extraneous variables—provides strong support for causal conclusions. At the same time, the way that experiments are conducted sometimes leads to a different kind of criticism. Specifically, the need to manipulate the independent variable and control extraneous variables means that experiments are often conducted under conditions that seem artificial (Bauman, McGraw, Bartels, & Warren, 2014). In many psychology experiments, the participants are all undergraduate students and come to a classroom or laboratory to fill out a series of paper-and-pencil questionnaires or to perform a carefully designed computerized task. Consider, for example, an experiment in which researcher Barbara Fredrickson and her colleagues had undergraduate students come to a laboratory on campus and complete a math test while wearing a swimsuit (Fredrickson, Roberts, Noll, Quinn, & Twenge, 1998). At first, this manipulation might seem silly. When will undergraduate students ever have to complete math tests in their swimsuits outside of this experiment? The issue we are confronting is that of external validity. An empirical study is high in external validity if the way it was conducted supports generalizing the results to people and situations beyond those actually studied. As a general rule, studies are higher in external validity when the participants and the situation studied are similar to those that the researchers want to generalize to and participants encounter everyday, often described as mundane realism. Imagine, for example, that a group of researchers is interested in how shoppers in large grocery stores are affected by whether breakfast cereal is packaged in yellow or purple boxes. Their study would be high in external validity and have high mundane realism if they studied the decisions of ordinary people doing their weekly shopping in a real grocery store. If the shoppers bought much more cereal in purple boxes, the researchers would be fairly confident that this increase would be true for other shoppers in other stores. Their study would be relatively low in external validity, however, if they studied a sample of undergraduate students in a laboratory at a selective university who merely judged the appeal of various colours presented on a computer screen; however, this study would have high psychological realism where the same mental process is used in both the laboratory and in the real world. If the students judged purple to be more appealing than yellow, the researchers would not be very confident that this preference is relevant to grocery shoppers’ cereal-buying decisions because of low external validity but they could be confident that the visual processing of colours has high psychological realism. We should be careful, however, not to draw the blanket conclusion that experiments are low in external validity. One reason is that experiments need not seem artificial. Consider that Darley and Latané’s experiment provided a reasonably good simulation of a real emergency situation. Or considerfield experiments that are conducted entirely outside the laboratory. In one such experiment, Robert Cialdini and his colleagues studied whether hotel guests choose to reuse their towels for a second day as opposed to having them washed as a way of conserving water and energy (Cialdini, 2005). These researchers manipulated the message on a card left in a large sample of hotel rooms. One version of the message emphasized showing respect for the environment, another emphasized that the hotel would donate a portion of their savings to an environmental cause, and a third emphasized that most hotel guests choose to reuse their towels. The result was that guests who received the message that most hotel guests choose to reuse their towels reused their own towels substantially more often than guests receiving either of the other two messages. Given the way they conducted their study, it seems very likely that their result would hold true for other guests in other hotels. A second reason not to draw the blanket conclusion that experiments are low in external validity is that they are often conducted to learn about psychological processes that are likely to operate in a variety of people and situations. Let us return to the experiment by Fredrickson and colleagues. They found that the women in their study, but not the men, performed worse on the math test when they were wearing swimsuits. They argued that this gender difference was due to women’s greater tendency to objectify themselves—to think about themselves from the perspective of an outside observer—which diverts their attention away from other tasks. They argued, furthermore, that this process of self-objectification and its effect on attention is likely to operate in a variety of women and situations—even if none of them ever finds herself taking a math test in her swimsuit. In addition to the generalizability of the results of an experiment, another element to scrutinize in a study is the quality of the experiment’s manipulations, or the construct validity. The research question that Darley and Latané started with is “does helping behaviour become diffused?” They hypothesized that participants in a lab would be less likely to help when they believed there were more potential helpers besides themselves. This conversion from research question to experiment design is called operationalization (see Chapter 2 for more information about the operational definition). Darley and Latané operationalized the independent variable of diffusion of responsibility by increasing the number of potential helpers. In evaluating this design, we would say that the construct validity was very high because the experiment’s manipulations very clearly speak to the research question; there was a crisis, a way for the participant to help, and increasing the number of other students involved in the discussion, they provided a way to test diffusion. What if the number of conditions in Darley and Latané’s study changed? Consider if there were only two conditions: one student involved in the discussion or two. Even though we may see a decrease in helping by adding another person, it may not be a clear demonstration of diffusion of responsibility, just merely the presence of others. We might think it was a form of Bandura’s social inhibition (discussed in Chapter 4). The construct validity would be lower. However, had there been five conditions, perhaps we would see the decrease continue with more people in the discussion or perhaps it would plateau after a certain number of people. In that situation, we may not necessarily be learning more about diffusion of responsibility or it may become a different phenomenon. By adding more conditions, the construct validity may not get higher. When designing your own experiment, consider how well the research question is operationalized your study. A common critique of experiments is that a study did not have enough participants. The main reason for this criticism is that it is difficult to generalize about a population from a small sample. At the outset, it seems as though this critique is about external validity but there are studies where small sample sizes are not a problem (Chapter 10 will discuss how small samples, even of only 1 person, are still very illuminating for psychology research). Therefore, small sample sizes are actually a critique of statistical validity. The statistical validity speaks to whether the statistics conducted in the study support the conclusions that are made. Proper statistical analysis should be conducted on the data to determine whether the difference or relationship that was predicted was found. The number of conditions and the number of total participants will determine the overall size of the effect. With this information, a power analysis can be conducted to ascertain whether you are likely to find a real difference. When designing a study, it is best to think about the power analysis so that the appropriate number of participants can be recruited and tested (more on effect sizes in Chapter 12). To design a statistically valid experiment, thinking about the statistical tests at the beginning of the design will help ensure the results can be believed. These four big validities–internal, external, construct, and statistical–are useful to keep in mind when both reading about other experiments and designing your own. However, researchers must prioritize and often it is not possible to have high validity in all four areas. In Cialdini’s study on towel usage in hotels, the external validity was high but the statistical validity was more modest. This discrepancy does not invalidate the study but it shows where there may be room for improvement for future follow-up studies (Goldstein, Cialdini, & Griskevicius, 2008). Morling (2014) points out that most psychology studies have high internal and construct validity but sometimes sacrifice external validity. Notice that the manipulation of an independent variable must involve the active intervention of the researcher. Comparing groups of people who differ on the independent variable before the study begins is not the same as manipulating that variable. For example, a researcher who compares the health of people who already keep a journal with the health of people who do not keep a journal has not manipulated this variable and therefore not conducted an experiment. This distinction is important because groups that already differ in one way at the beginning of a study are likely to differ in other ways too. For example, people who choose to keep journals might also be more conscientious, more introverted, or less stressed than people who do not. Therefore, any observed difference between the two groups in terms of their health might have been caused by whether or not they keep a journal, or it might have been caused by any of the other differences between people who do and do not keep journals. Thus the active manipulation of the independent variable is crucial for eliminating the third-variable problem. Of course, there are many situations in which the independent variable cannot be manipulated for practical or ethical reasons and therefore an experiment is not possible. For example, whether or not people have a significant early illness experience cannot be manipulated, making it impossible to conduct an experiment on the effect of early illness experiences on the development of hypochondriasis. This caveat does not mean it is impossible to study the relationship between early illness experiences and hypochondriasis—only that it must be done using nonexperimental approaches. We will discuss this type of methodology in detail later in the book. In many experiments, the independent variable is a construct that can only be manipulated indirectly. For example, a researcher might try to manipulate participants’ stress levels indirectly by telling some of them that they have five minutes to prepare a short speech that they will then have to give to an audience of other participants. In such situations, researchers often include a manipulation check in their procedure. A manipulation check is a separate measure of the construct the researcher is trying to manipulate. For example, researchers trying to manipulate participants’ stress levels might give them a paper-and-pencil stress questionnaire or take their blood pressure—perhaps right after the manipulation or at the end of the procedure—to verify that they successfully manipulated this variable. As we have seen previously in the chapter, an extraneous variable is anything that varies in the context of a study other than the independent and dependent variables. In an experiment on the effect of expressive writing on health, for example, extraneous variables would include participant variables (individual differences) such as their writing ability, their diet, and their shoe size. They would also include situational or task variables such as the time of day when participants write, whether they write by hand or on a computer, and the weather. Extraneous variables pose a problem because many of them are likely to have some effect on the dependent variable. For example, participants’ health will be affected by many things other than whether or not they engage in expressive writing. This influencing factor can make it difficult to separate the effect of the independent variable from the effects of the extraneous variables, which is why it is important to control extraneous variables by holding them constant. Extraneous variables make it difficult to detect the effect of the independent variable in two ways. One is by adding variability or “noise” to the data. Imagine a simple experiment on the effect of mood (happy vs. sad) on the number of happy childhood events people are able to recall. Participants are put into a negative or positive mood (by showing them a happy or sad video clip) and then asked to recall as many happy childhood events as they can. The two leftmost columns of Table 6.1 show what the data might look like if there were no extraneous variables and the number of happy childhood events participants recalled was affected only by their moods. Every participant in the happy mood condition recalled exactly four happy childhood events, and every participant in the sad mood condition recalled exactly three. The effect of mood here is quite obvious. In reality, however, the data would probably look more like those in the two rightmost columns of Table 6.1. Even in the happy mood condition, some participants would recall fewer happy memories because they have fewer to draw on, use less effective recall strategies, or are less motivated. And even in the sad mood condition, some participants would recall more happy childhood memories because they have more happy memories to draw on, they use more effective recall strategies, or they are more motivated. Although the mean difference between the two groups is the same as in the idealized data, this difference is much less obvious in the context of the greater variability in the data. Thus one reason researchers try to control extraneous variables is so their data look more like the idealized data in Table 6.1, which makes the effect of the independent variable easier to detect (although real data never look quite that good). One way to control extraneous variables is to hold them constant. This technique can mean holding situation or task variables constant by testing all participants in the same location, giving them identical instructions, treating them in the same way, and so on. It can also mean holding participant variables constant. For example, many studies of language limit participants to right-handed people, who generally have their language areas isolated in their left cerebral hemispheres. Left-handed people are more likely to have their language areas isolated in their right cerebral hemispheres or distributed across both hemispheres, which can change the way they process language and thereby add noise to the data. In principle, researchers can control extraneous variables by limiting participants to one very specific category of person, such as 20-year-old, heterosexual, female, right-handed psychology majors. The obvious downside to this approach is that it would lower the external validity of the study—in particular, the extent to which the results can be generalized beyond the people actually studied. For example, it might be unclear whether results obtained with a sample of younger heterosexual women would apply to older homosexual men. In many situations, the advantages of a diverse sample outweigh the reduction in noise achieved by a homogeneous one. The second way that extraneous variables can make it difficult to detect the effect of the independent variable is by becoming confounding variables. A confounding variable is an extraneous variable that differs on average across levels of the independent variable. For example, in almost all experiments, participants’ intelligence quotients (IQs) will be an extraneous variable. But as long as there are participants with lower and higher IQs at each level of the independent variable so that the average IQ is roughly equal, then this variation is probably acceptable (and may even be desirable). What would be bad, however, would be for participants at one level of the independent variable to have substantially lower IQs on average and participants at another level to have substantially higher IQs on average. In this case, IQ would be a confounding variable. To confound means to confuse, and this effect is exactly why confounding variables are undesirable. Because they differ across conditions—just like the independent variable—they provide an alternative explanation for any observed difference in the dependent variable. 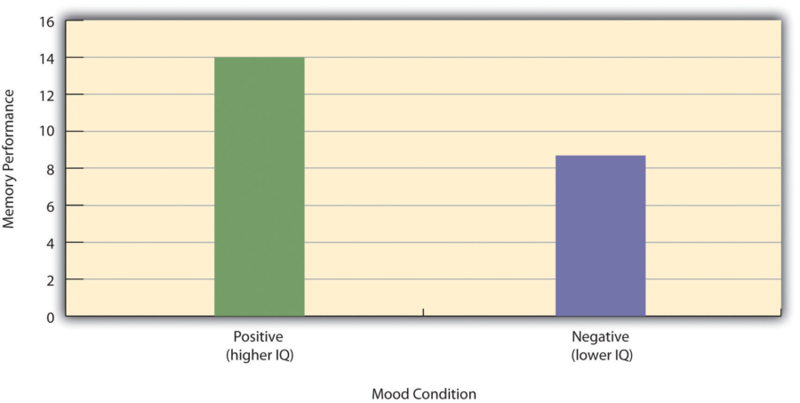 Figure 6.1 shows the results of a hypothetical study, in which participants in a positive mood condition scored higher on a memory task than participants in a negative mood condition. But if IQ is a confounding variable—with participants in the positive mood condition having higher IQs on average than participants in the negative mood condition—then it is unclear whether it was the positive moods or the higher IQs that caused participants in the first condition to score higher. One way to avoid confounding variables is by holding extraneous variables constant. For example, one could prevent IQ from becoming a confounding variable by limiting participants only to those with IQs of exactly 100. But this approach is not always desirable for reasons we have already discussed. A second and much more general approach—random assignment to conditions—will be discussed in detail shortly. Figure 6.1 Hypothetical Results From a Study on the Effect of Mood on Memory. Because IQ also differs across conditions, it is a confounding variable. An experiment is a type of empirical study that features the manipulation of an independent variable, the measurement of a dependent variable, and control of extraneous variables. Studies are high in internal validity to the extent that the way they are conducted supports the conclusion that the independent variable caused any observed differences in the dependent variable. Experiments are generally high in internal validity because of the manipulation of the independent variable and control of extraneous variables. Studies are high in external validity to the extent that the result can be generalized to people and situations beyond those actually studied. Although experiments can seem “artificial”—and low in external validity—it is important to consider whether the psychological processes under study are likely to operate in other people and situations. Practice: List five variables that can be manipulated by the researcher in an experiment. List five variables that cannot be manipulated by the researcher in an experiment. Practice: For each of the following topics, decide whether that topic could be studied using an experimental research design and explain why or why not. Effect of parietal lobe damage on people’s ability to do basic arithmetic. Effect of being clinically depressed on the number of close friendships people have. Effect of group training on the social skills of teenagers with Asperger’s syndrome. Effect of paying people to take an IQ test on their performance on that test. Experiment Basics by Paul C. Price, Rajiv Jhangiani, & I-Chant A. Chiang is licensed under a Creative Commons Attribution-NonCommercial-ShareAlike 4.0 International License, except where otherwise noted.